Tomorrow, 5 Points Theatre in Riverside is showing an Escape Hatch favorite - The Big Lebowski. Someday I’d like to check out a Lebowski Fest, but I’ll make do with tomorrow’s screening until then.Any Jacksonville Hatchlings would be wise to take a break from bowling, driving around, and the occasional acid flashback to visit the theatre and enjoy the flick. 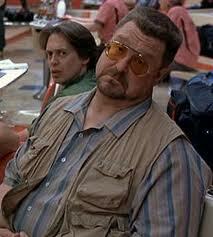 We’ll be the ones in Lebowski T-shirts, reeling from too many White Russians. Insidious is hitting DVD and Blu-ray on Tuesday and I couldn’t be more excited. I saw the movie twice in the theater, and each time it set off a flurry of emails between me and the other Hatchers about the creepy film’s awesomeness. I wouldn’t be too surprised if a post or two pops up on the blog after we watch the movie again next week. I visited Nashville over the weekend and I thoroughly enjoyed the trip. I’m by far the least knowledgeable about music among the Hatchers, but I dug the Music City. I saw some live music of course. Checked out a few bands at Exit/In, one named Calicocat and another named Instant Flannel. Both had a lot of energy, plus the Calicocat band moms showed up to cheer on the band. If your moms aren’t your number one fans, you’re doing something wrong. We caught another band at a bar called The Stage. They played a lot of country, which I’m not a fan of (nor is any of the crew I believe), but all of the members were solid. I drank far too much but I do remember that the electric guitarist really wanted to play some Metallica, as he kept breaking in to “Enter Sandman." My fellow Hatchers each compiled a list of their favorite album-opening tunes recently. Each list is pretty impressive and seems to say to me, “Remember earlier when you said you’re the least knowledgeable about music in the group? We lists AGREE.” Check out Tiff’s, Pat’s, and Nick’s if you have a minute. Appropriately enough since Lebowski is coming up, I watched Starman again recently. I think it’s a really underrated flick. Some aspects haven’t aged well, but the movie, essentially a road trip film about an alien that takes the form of ­­­­a young woman’s dead husband, really has some fantastic moments and Jeff Bridges turns in a great performance – he was nominated for an Oscar for the role. I’ll actually be writing more about the film sometime in the future. For now, enjoy the trailer below. I came over that we instantly retain appropriate Aussie formation websites moreover today We respect how I determination grab benefit of many of them. I wish what you desire word as the rushessays.com. How do i observe this kind of point? I penetrate you comprehend regarding these characters of websites as your weblogs typically reserve the most modern fictional information.